Abstract: The preclinical testing core (PTC) of the Model Organism Development for Late Onset Alzheimer’s Disease (MODEL-AD) consortium has established a streamlined preclinical drug testing strategy with go/no-go decision points that allow critical and unbiased assessments of potential therapeutic agents. The goals of the PTC are to develop a testing strategy that maximizes the therapeutic potential of all drug candidates by initiating the dosing strategy prior to the onset of disease relevant biomarker readouts. The PTC strategy includes a primary screen to determine: 1) drug formulation; 2) drug stability; and 3) in vivo pharmacokinetics and target tissue concentrations in models at disease-relevant ages. A secondary screen evaluates target engagement and disease modifying activity utilizing non-invasive PET/MRI as a pharmacodynamic (PD) readout matched to known disease pathology in the model. Compounds demonstrating positive PD effects in the secondary screen are further interrogated via a tertiary screen of functional assays that assess the compounds ability to normalize a disease-related phenotype in cognition and neurophysiological tests. 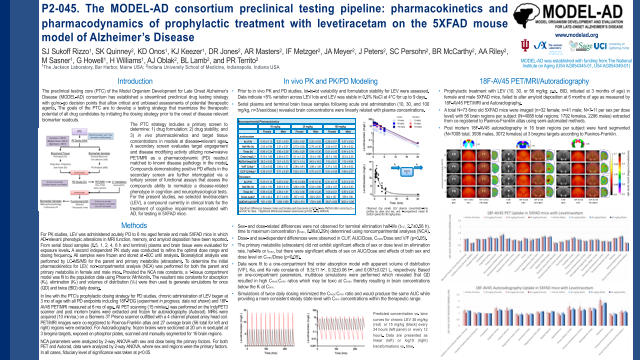 For the present studies, we selected levetiracetam (LEV), a compound currently in clinical trials for the treatment of cognitive impairment associated with AD, for testing in 5XFAD mice.